Bluecoat D3 is technologically advanced product. Conforms EN 204/D3 standards. 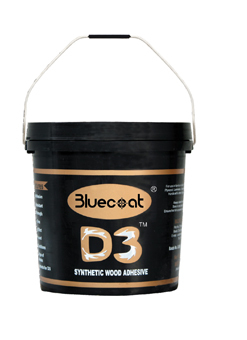 Bluecoat D3 is non structural adhesive for joining wood and derived timber products such as bonding of furniture internal structures, paneling, doors, windows lamination etc. For bonding laminates, plywood, veneer, block-board, Hard-board, MDF etc. Bluecoat D3 is to be used in places, where there is intermittent water splashing where high water resistance is required. For edge bonding, finger jointing, handicraft, modular furniture, cold press / hot press, post forming application & wooden flooring. When not in use keep container closed & keep away from Sunlight. 9 months - Best within 6 months from the date of manufacturing.